It’s easier than ever to contribute to science, and this study proves it best. Amateur astronomers using an online platform have discovered five rocky planets orbiting a far-off star. To make things even more exciting, the planets are orbiting in an interesting mathematical relationship called a resonance chain — every planet takes 50% longer to orbit than the previous one. Artist’s concept of a top-down view of the K2-138 system discovered by citizen scientists, showing the orbits and relative sizes of the five known planets. Orbital periods of the five planets, shown to scale, fall close to a series of 3:2 mean motion resonances. This indicates that the planets orbiting K2-138, which likely formed much farther away from the star, migrated inward slowly and smoothly. Credit: NASA/JPL-Caltech. 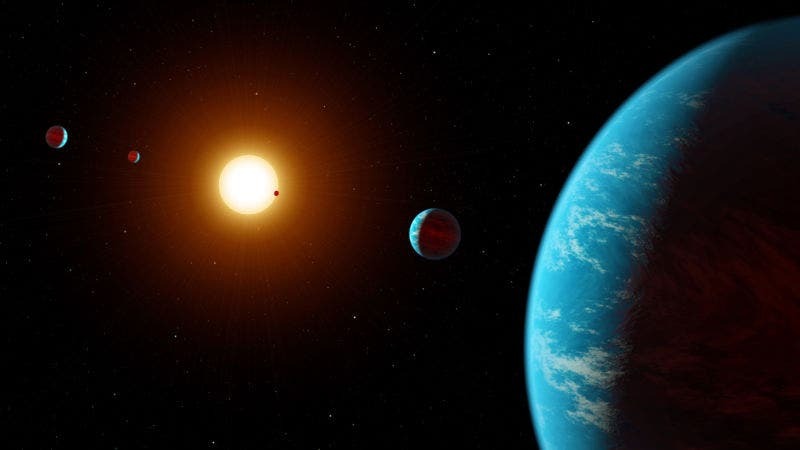 In March 2017, the initial prototype of Exoplanet Explorers was set up on Zooniverse, a citizen science web portal headquartered at Oxford University. Exoplanet Explorers had amateur astronomers analyze data from NASA’s Kepler telescope trails — it was data which had never been analyzed by astronomers. Just 48 hours after the project was launched, researchers had received 2 million classifications from more than 10,000 users. “People anywhere can log on and learn what real signals from exoplanets look like, and then look through actual data collected from the Kepler telescope to vote on whether or not to classify a given signal as a transit, or just noise,” said co-author Dr Jessie Christiansen, from Caltech in Pasadena. The system required several people to look at the data and indicate an interesting objective. “We have each potential transit signal looked at by a minimum of 10 people, and each needs a minimum of 90 percent of ‘yes’ votes to be considered for further characterization,” Christiansen. After going through the entire dataset, scientists analyzed the demographics of the discovered planets: 44 Jupiter-sized planets, 72 Neptune-sized, 44 Earth-sized, and 53 so-called Super Earth’s — rocky planets larger than Earths but smaller than Neptune. An artist’s depiction of K2-138. This is brutally inaccurate, as all five planets are in close proximity to the host star. There’s no way water would exist on the surface, as portrayed here. Come on NASA, you’re better than this. (Image: NASA/JPL-Caltech). 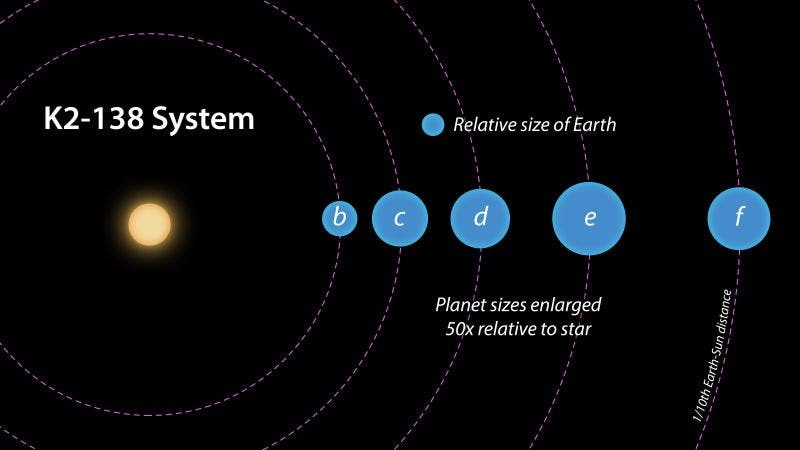 Astronomers were thrilled to see that among the finds there was a system of five planets, all of which were slightly larger than Earth, ranging between 1.6 and 3.3 times the radius of Earth. The planets are locked in a phenomenon called orbital resonance. This means that there’s a simple mathematical relationship between the planets’ orbital periods. In this case, it’s 3:2 — each planet’s orbit is 50% longer than the previous one. This resonance chain of five planets is the longest one ever discovered, though other chains have also been discovered. This unusual relationship gets even more interesting. Data also revealed a sixth planet, still in resonance, but which it skips two slots in the resonance chain. This might indicate a missing planet, or it might indicate another, unknown process. It’s even more intriguing that this resonance coincides with a perfect fifth, an interval found commonly found in music. However, the interval isn’t exactly perfect. Instead of the ratio being exactly 1.5 (3:2), it’s 1.513, 1.518, 1.528, and 1.544 respectively. 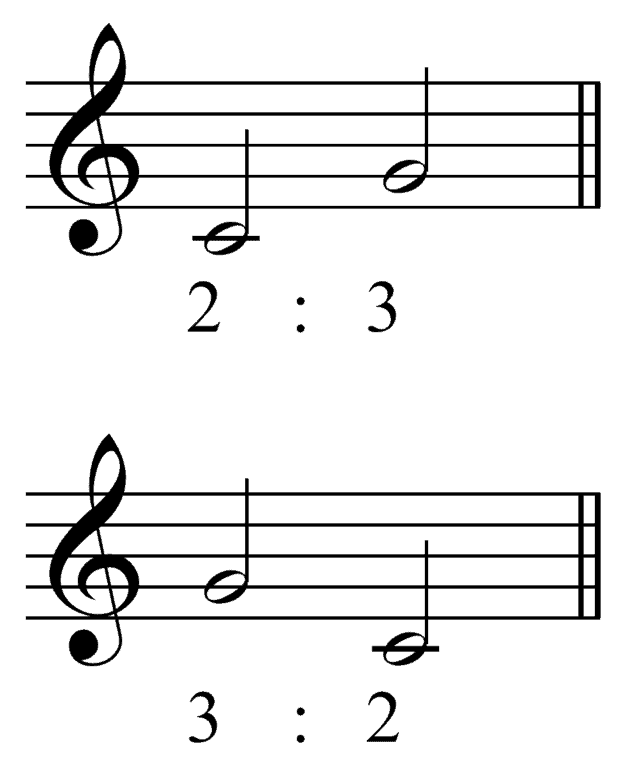 This yields another similarity to music, where musicians often tune their instruments just slightly off from a perfect-fifth to avoid the annoying “beat” that occurs when the tuning is too perfect. The planets are locked in orbital resonance — like a musical perfect fifth. Image via Wikipedia. Even so, the most interesting thing about these planets is the way they were found. Nowadays, there’s just too much available data and not enough researchers to look at it. Algorithms are also limited in their scope. Having the sheer brain processing power of thousands of volunteers is simply irreplaceable. The study was published in the online edition of The Astronomical Journal.